Grocery shopping can be fraught with confusion unless you know how to read food labels. Do you ever wonder if the products you’re buying at the supermarkets are really as healthy as they claim to be? For most of us, it can be difficult to decide which product is the best version for you and your family. Claims such as ‘fat-free’, ‘low salt’, and ‘no added sugar’ can lure us into thinking these products are healthy. But unless you know how to read a food label in its entirety, you could be falling for misleading marketing. If you want to determine the health benefits of a product, the best way is to look at both the ingredient list and the nutrition information. Ingredients are listed in descending order which means the ingredient at the top of the list is the largest component of the food. The ingredient list will give you a good idea of the nutritional benefits of the product, as well as alerting you to any ingredients you may be allergic to (e.g. peanuts, egg, dairy, gluten). As a general guide, the more items in the list, the more processed the food is likely to be. In addition, take note of the average amount of energy, protein, fat, saturated fat, carbohydrate, sugars and sodium in a serve and in 100g (or 100ml) of the food. If you’re comparing two different products be sure to compare the amounts in the 100g (or 100ml) columns – it’s easier! In addition to the information above, many products will include other nutrition content claims such as ‘low-fat’, ‘gluten free’, and ‘no artificial colours’. While they can provide useful information (particularly in the case of allergies), they can also be a little misleading. For example, lollies may be marketed as being ‘99% fat free’. While they contain virtually no fat, they are extremely high in sugar, and not necessarily a healthy choice. What do nutrition content claims really mean? When it comes to nutrition content claims, it’s worth knowing what each means. High in fibre — must contain at least 3g of fibre per 100g. There are other claims which you shouldn’t read in isolation. ‘Light’ or ‘lite’ products may mean the food is light in colour or taste, not necessarily in kilojoules, fat or sugar. 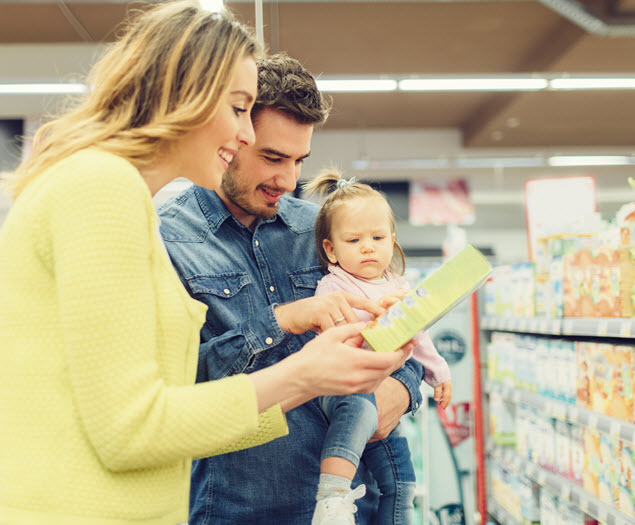 Products that claim to have ‘no added salt’ or ‘no added sugar’, may already be high in salt or sugar, so check the nutrition information panel to be sure. Foods that claim to be ‘low-joule’ or ‘diet’ are either low in sugar and/or fat, but may contain artificial sweeteners. Low fat products may contain high levels of sugar. While it may take you a while to get your head around food labels, it’s a skill worth acquiring. With a little practice, you’ll be able to sleuth with the best of them, sorting out the healthy from the hype, and ensuring that your family eats as healthily as possible.